Iranian President Hassan Rouhani prepares to speak with NPR's Steve Inskeep on Saturday in New York. Rouhani reaffirmed Iran's commitment to the nuclear deal and said his country would be willing to discuss Syria's future with the United States â after ISIS is defeated. Here&apos;s the basic difference between the United States, Russia and Iran: The U.S. wants Syrian President Bashar Assad to go. Russia and Iran, Assad&apos;s allies, want him to stay. Over the weekend, Iran&apos;s president, Hassan Rouhani, met with NPR in New York, where he will be attending the United Nations General Assembly. Through an interpreter, Rouhani argued that, where Syria is concerned, the most important issue for everyone is destroying ISIS. "Perhaps political reform is needed. However, is that today&apos;s priority? We believe that it&apos;s driving out the terrorists," he tells NPR. "The issue of stability and security in the region is of utmost importance for us," he emphasizes. Americans may not like Syria&apos;s government, he says, but Iran needs to prop it up to avoid a dangerous leadership vacuum. If Assad goes now, Rouhani says, extremists will step in. So Iran is collaborating with Syria, Russia and Iraq against ISIS. An intelligence-sharing agreement among the four countries was announced by Iraq on Sunday. "We say between worse and bad, we must choose bad. Or in other words, we choose the lesser of two evils," he says. Where Syria is concerned, "It&apos;s not that we are indifferent," Rouhani says. "We do care about the situation in Syria, we do worry about the people of Syria, we do worry and our hearts bleed for so many people that are killed on a daily basis, who are driven from their homes. And you do know that archaeological and cultural remains in Syria have been destroyed on an almost daily basis by the terrorists. So all of this worries us." Rouhani contends that world powers need a "formula" for who or what might replace Assad. He says he is prepared to open the discussion with the U.S., Russia and other concerned powers as to what that formula might be. "That is not a problem for us from right now, to start holding discussions and dialogues so as to determine and reach the conclusion of the next plan of action after the terrorists are driven out of that territory," he says. "But we must all act in unison and have a formula that is required to drive out the terrorists — immediately after which the following, the subsequent steps will come." This is news: Iran is ready to talk with the United States about Syria&apos;s future. But notice the qualifiers: Iran is ready to talk about what may happen with Assad, only after the defeat of ISIS. 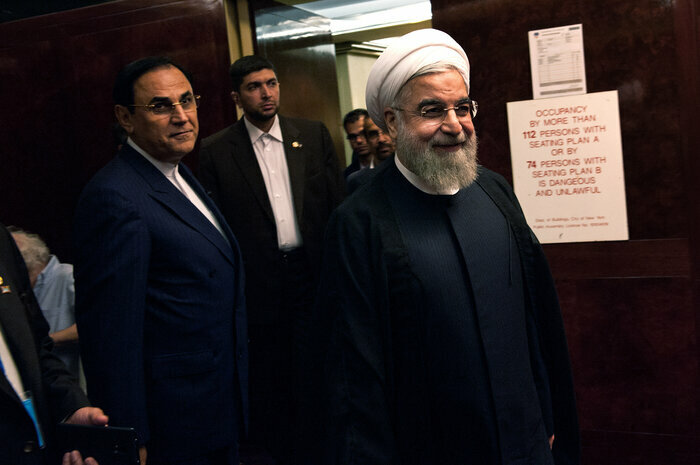 Rouhani is one of Iran&apos;s ultimate insiders — a gray-bearded, white-turbaned Shiite cleric in his mid-60s. When he met with NPR on Saturday night, he relaxed in his chair, and when asked tricky questions — such as where he is on Iran&apos;s political spectrum — he would smile as he began to answer. Rouhani served for years in senior positions under Iran&apos;s conservative supreme leader, Ayatollah Ali Khamenei. Yet he campaigned in 2013 promising change, and is now associated with opening up his nation. "I would always choose a middle-of-the-road path ... because my opinion has [been] and is that we can use both reformists and those who are conservatives," he says. He&apos;s the man whose election two years ago paved the way for Iran&apos;s historic nuclear deal with the U.S. and other world powers. Now, Washington and others want more cooperation. But Khamenei, the supreme leader, wants to hold off cooperating with the U.S. on Syria until he sees how the nuclear deal works out. 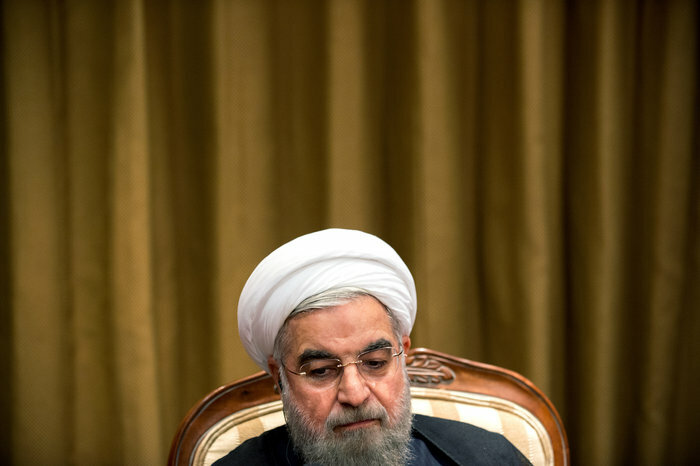 Rouhani says his country has a "religious duty" to follow its nuclear agreement. "My country, my nation, if it accepts an agreement, if it signs an agreement, if it gives its commitment to live up to the terms of an agreement, it will certainly do so," he says. "We have never broken our commitment. This is our cultural framework, this is our comportment, this is our religious duty." The question now is whether the president can nudge his whole country to go along with him. Iran accepted limits on its nuclear program. The U.S. and other nations agreed to lift economic sanctions. They also plan to return billions of dollars in frozen Iranian assets. Many in the U.S. and Israel fear Iran will use that wealth to finance groups like Hamas and Hezbollah abroad. Rouhani insists that he wants to spend those billions at home. "You do know that we have a very young population," he says. "Sixty-five percent of the population in Iran is under 35 years of age. And many of them today are students. ... And every year, many of these students will graduate, so they will need to enter the job market." Spinning off statistics from memory, he says Iran needs billions in investment to keep up with its growing population. "That is our priority, job creation is our priority, and to decrease unemployment," he says. "Otherwise, we&apos;re endangering our own national security." Iranian society has opened up a little in the past two years. Reformist groups are sometimes allowed to win elections and agitate for change — yet conservative clerics and military figures still hold ultimate power. Rouhani&apos;s task is to bridge them all. At one point in his meeting with NPR, he sounded remarkably like an advocate for free speech, saying, "Those who have their own opinions or differing opinions as far as social issues or cultural issues are concerned, we need to hear everyone&apos;s voices." But sometimes the dissenting voices can include those disagreeing with him when it comes to the nuclear deal. The other day, Rouhani addressed leaders of Iran&apos;s powerful military force, the Revolutionary Guard. Under Iran&apos;s complicated system, the force does not report to the president. Its commander has said that the nuclear deal is unacceptable. "Of course, some in Iran were against this agreement, and their analysis and their reasoning and justification was that the implementation of this agreement can have an unwanted negative impact on the defensive capabilities of the nation," Rouhani says. "But my position was that we did not accept any limitations that would impact, negatively impact, the defensive capabilities of our nation." Reassuring Iran&apos;s powerful military, even as the country enters a new era ushered in by the nuclear deal, is all part of Rouhani&apos;s delicate balancing act. He says his goal is to sustain modest improvements in his country. Many Americans would applaud those efforts. But Rouhani is also committed to preserving an Islamic Republic that many Americans oppose.